Always ready for family fun with a multitude of spaces for games, audio, video and memorabilia, this media / entertainment center has room for it all, yet keeps everything neat and under control within it's stylish confines. 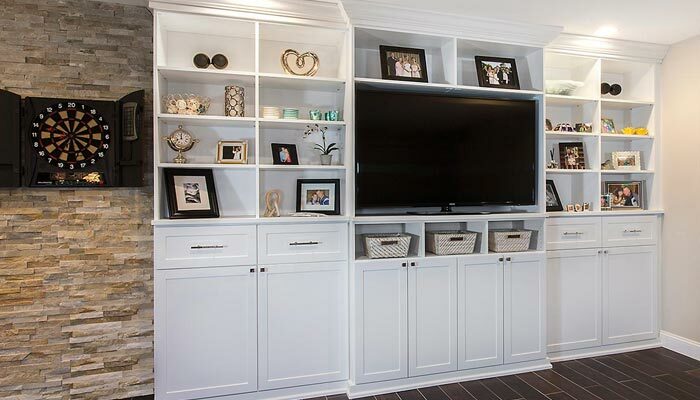 Closet Works configured this media center and wall unit custom organization system to function as the perfect hub for family entertainment. Baskets on shelves under the TV area offer a place to keep small items like game and memory cards accessible, yet organized, while drawers store CDs and DVDs. Cabinets keep audio/video components and gaming systems out of site, and also offer additional storage for traditional family entertainment items like puzzles and games. Upper shelving increases storage further and holds a multitude of treasures in this family-centered entertainment space. Whether used as a traditional media center for electronics, or simply a place to showcase personal mementos, this piece offers a stunning yet practical answer to the family's needs.